BACKGROUND: Owing to the aggressive nature of high-grade gliomas (HGGs), its early diagnosis holds the key to a favorable prognosis. Currently, tissue biopsy is the gold standard to verify HGG's initial diagnosis and can be challenging due to its invasive nature. In this study, our objective was a noninvasive panel for timely detection of HGG and its progression using cell-free circulating tumor DNA (cfTDNA). MATERIALS AND METHODS: Twenty-seven patients with HGG were tested with a 50-gene tumor panel. cfTDNA isolated from serum was checked for single-nucleotide variations (SNVs) or copy number alterations using targeted next-generation sequencing, with further validation of results by checking respective formalin-fixed paraffin-embedded tumor tissues for the same genetic alterations. RESULTS: About 88.8% of the patients were detected with HGG-associated cfTDNA. Around 25% patients were detected with one, 25% patients had three, 25% patients had four, and 12.5% patients each had five and six genetic alterations. About 12 of 50 genes were detected in the serum samples. The SNVs detected included TP53 in 87.5% of patients; PIK3CA and EGFR in 50% of patients; PTEN in 37.5%; KIT and VHL in each 25% of patients; and RB1, NF2, MET, ATRX, CDK2A, and CTNNB1 each in 8.3%–16.6%. On combining EGFR, KIT, PTEN, PIK3CA, TP53, and VHL genes (Govardhan Diagnostic Genetic Module for high-grade glioma), at least one of the genetic alterations was found in 100% of patients. Conclusion: These findings illustrate that cfTDNA is easily demonstrable and can be used as a surrogate to tissue biopsy in brain tumor. Despite high complexity in the genetic profile of high-grade gliomas (HGGs), its clinical management remains reliant on histopathology and neuroimaging studies. Intratumoral genetic heterogeneity present within the primary tumor and dynamic changes it goes with different therapies (chemotherapy and radiotherapy), hampers the proper therapeutic results.,, Furthermore, it is a known fact that neuro-imaging has its own way of interpretation. A lack of positive prediction of diagnosis and monitoring therapy (for instance to differentiate between disease progression and pseudo-progression post-therapy) restricts the usage of this method.,, Hence, there is a need for more sophisticated system of tumor analysis and monitoring on real-time basis. A number of studies have demonstrated the ability of cfTDNA to diagnose HGGs, but mainly in cerebrospinal fluid (CSF), whereas in plasma only a handful of studies exist with small sample size and poorer method of detection.,,, Thus, in this investigation we have aimed at the use of cfTDNA as a noninvasive diagnostic tool in HGG by studying the genetic alterations in isolated cfTDNA and to generate a diagnostic genetic module from the spotted genetic alterations. A total of 27 patients (n = 27) with histopathologically confirmed HGG who underwent biopsy or near-total excision were enrolled prospectively in the study after signing the appropriate informed consent. The patients had a median age of 32.5 years (range: 24–60 years) with the majority (87.5%) of the population being male. In all the cases, a biopsy of a formalin-fixed paraffin-embedded (FFPE) tumor tissue was available. Demographical, clinicopathological features (stage, grade), courses of treatment(s), and vital status were acquired from the clinical and pathology reports. A total of 27 venous blood samples were collected into BD Vacutainer® Blood Collection Tube (Becton Dickinson and Company, Franklin Lake, NJ, USA) with K3 EDTA, and 4 mL of serum was obtained by centrifugation within 3 h after blood extraction at 2500 rpm at 37°C. DNA was extracted from the serum by QIAamp Circulating Nucleic Acid Kit (Qiagen, Valencia, CA, USA) according to the manufacturer's instructions. We designed a 50-gene panel based on our previous studies and publically available databases. The cfTDNA detected in the serum samples was sufficient to carry out NGS. Genes carrying specific somatic mutations like single-nucleotide variations (SNVs)/copy number alterations (CNAs) were screened by next-generation sequencing (NGS) using this panel. For the analyses of FFPE tumor samples, DNA was purified from four 5.0-mm-thick unstained FFPE sections according to the QIAamp DNA FFPE Tissue Kit (Qiagen) protocol, and the gene mutations were screened by NGS targeting 50 cancer genes [Table 1]. To rule out the germline mutations and to correlate with cfTDNA, relevant statistical test was exercised. The correlation among the quantitative variables was evaluated with simple linear regression analysis. P < 0.005 was considered to be statistically significant. We report data from 27 patients (male/female: 87.5%:12.5%) with HGG who had undergone biopsy or near-total excision who were prospectively enrolled in the study. The patient characteristics of the study population are summarized in [Table 2]. The source of archival tissue sample was the FFPE blocks. First, we evaluate the patients detected with cfTDNA. Overall, we detected cfTDNA in 24 patients (88.8%) out of 27 [Table 2]. Six of 24 (25%) patients had one genomic alteration indentified, 6 of 24 (25%) patients had three genetic alterations, another 6 of 24 (25%) patients had four genetic alterations, and 3 of 24 (12.5%) patients each had five and six genetic alterations. Of 50 genes, only 12 genes were detected [Table 3]. As shown in [Figure 1], SNVs detected included TP53 in 21 (87.5%) patients; PIK3CA and EGFR each in 12 (50%) patients; PTEN in 9 patients (37.5%); VHL and KIT each in 6 (25%) patients; and RB1, NF2, MET, ATRX, CDK2A, and CTNNB1 each in 2–4 patients (8.3%–16.6%) as shown in [Table 3]. 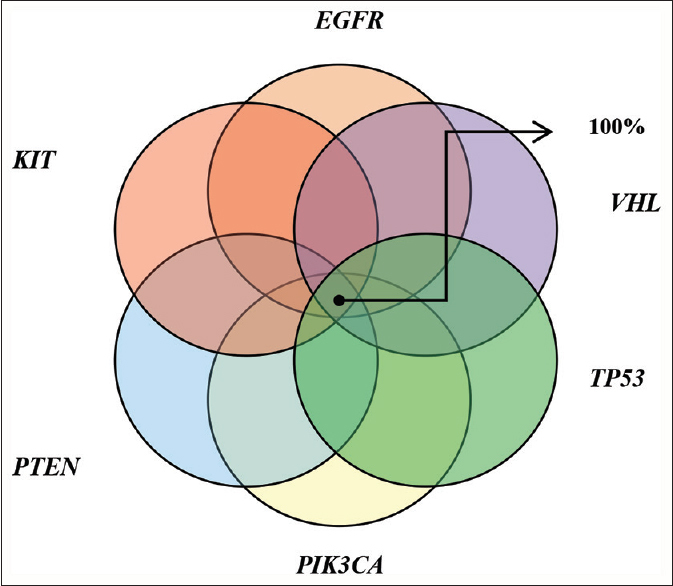 Interestingly, on combination of six major genetic alterations, that is, EGFR, KIT, PTEN, PIK3CA, TP53, and VHL, at least one of these genetic alterations was found in 100% of patients at any point of time as shown in [Figure 1]. There was good agreement between the results by NGS and polymerase chain reaction (PCR) for FFPE blocks. Also, additional studies showed that O6-methylguanine-DNA-methyltransferase (MGMT) gene was found to be methylated in 14 of 27 (51.85%) of the samples, whereas 13 of 27 (48.15%) of samples showed unmethylated status for MGMT. Thus, this gene panel can be used as diagnostic genetic module (Govardhan Diagnostic Genetic Module for High-Grade Glioma). To our knowledge, this is the first attempt targeting an NGS study of cfTDNA to evaluate somatic mutations in patients with HGG where minimally invasive or noninvasive methods to monitor the disease burden and to know its dynamic changes is a challenging task. There are only a few noninvasive modalities such as CTC and cfTDNA (both in plasma and CSF) available to address these issues. cfTDNA is a small component of nucleic acid material derived from tumor cell and cell fragments. The CTCs are completely intact, sometimes viable, which can be isolated from blood by either physical and chemical characteristics or by cell surface molecular expressions that distinguish them from normal cells or blood cells. Many studies have been conducted to compare CTC and cfTDNA, where both entities were demonstrated in advanced cases. On comparing these we have reached contrasting conclusions in the view of technical issues like isolation of the circulating nucleic acids and interpretation of the results.,, A thorough research shows that only limited studies have compared cfTDNA with CTCs; some studies were limited by their isolation techniques, and some have showed that the detection rate of cfTDNA was higher than CTC detection.,, An article published in Nature Communications demonstrated that both CSF-tDNA and plasma-tDNA showed enriched quantity both with primary and metastatic brain tumors, and in some cases CSF-tDNA levels correspond to a change in tumor burden. The authors have also described in some cases mutations in CSF with brain metastases that were not seen in the primary tumor. cfTDNA in CSF is a minimally invasive method and cannot be done in all patients like those with acute conditions or with heightened intracranial tension. Also, the sensitivity of CSF cfTDNA is around 70%, and plasma cfTDNA is also nearer to that value; thus, in our study we have aimed to test the plasma cfTDNA. Presently, there will be definitive scarcity of literature on cfTDNA in brain tumor and utilization of cfTDNA in clinical setup. With all these, we have aimed to study the diagnostic ability of cfTDNA and its practical utility in clinical setup. In case if a mutational panel is used, there still arose a question of selection of list of appropriate mutations to be included in the panel. Thus, detection of platforms is broad enough for genomic coverage to fully characterize the spatial and temporal heterogeneity of tumors, but deep-sequencing approaches produce data with high levels of background noise which can obscure true genetic alterations. Newer NGS-based ctDNA detection methods such as SafeSeq, TAm-Seq, CAPP-Seq, and Ampli-Seq have improved but not entirely resolved the sensitivity-associated problems which remain difficult to optimize with broad coverage assays.,,, Thus, in our study, to resolve all these issues we used NGS-based mutation analysis. In addition, using broad-spectrum 50-gene analyses, the genetic alterations in cfTDNA were rechecked in tumor to increase the specificity of this experiment. cfTDNA can be exploited in monitoring the molecular basis of acquired drug resistance all through the course of treatment via tumor genetic profiles.,, Treatment allied genetic resistance can be sensed with cfTDNA at least 6 months sooner than it can be discovered by clinically available techniques or imaging., It is a hypothesis that in gliomas, the blood–brain barrier can become an obstruction both in treatment delivery and in detection of an effective biomarker. According to some studies, the frequency of detectable cfTDNA for gliomas was <10%, whereas in another study done by Piccioni et al. the detectibility of cfTDNA in glioblastma was 37%; but in our study, we managed to detect cfTDNA in all the above cases. The reason for low detectability may be the inferior technique used to isolate DNA. Though cfTDNA has showed diagnostic, prognostic, and predictive ability as well as utility in glioma, further large scale studies are required to prove its utility in outcome. The cost-effectiveness of the cfTDNA in the clinical setting remains another issue. Currently, the cost of NGS has been condensed over time and is improbable to be a limiting factor for this sort of work. Many minor studies have illustrated significant genetic alterations in EGRF, MGMT methylation, and 1p19q loss of heterozygosity, which can be detected in cfTDNA from patients with gliomas.,,,,, As most frequently mentioned, genetic alterations are used daily in clinical practices, and thus in our study we are aiming at detecting a broad spectrum of genetic alterations more important and relevant to less important relevant ones. Thus, we used a 50-gene panel to resolve the aforementioned issue. Twelve genes of the 50 in the panel were detected. The detection rate (24/27, 88.8%) was similar to another of our team's study that included patients suffering from cervical cancer where the detection rate was shown to be 84%. Six of 24 (25%) patients had one genomic alteration detected, 25% of patients had three genetic alterations, another 25% patients had four genetic alterations, and 3 of 24 (12.5%) patients had five and six genetic alteration each. As shown in [Figure 1], SNVs detected included TP53 in 21 of 24 (87.5%) patients; PIK3CA and EGFR in 50% patients each; PTEN in 37.5%; KIT and VHL in 25% patients each; RB1, NF2, MET, ATRX, CDK2A, and CTNNB1 in 2–4 patients (8.3%–16.6%) each as shown in [Table 3]. On combination of six major genetic alterations, that is, EGFR, KIT, PTEN, PIK3CA, TP53, and VHL, it was revealed that at least one genetic alteration among the combinations was found in 100% of patients at any point of time. Thus, it can be used as diagnostic genetic module (Govardhan Diagnostic and Screening Genetic Module for High-Grade Glioma). Using this model can guide further utilization of this module for initial screening will aid in rapid diagnosis of brain tumor as it is more sensitive and specific than imaging in this study. Additionally, the employment of this study holds a significant benefit in differentiating posttreatment progression and pseudoprogression but it is uncertain at this point on account of unavailability of recurrent cases genetic profile. Furthermore, follow-up data regarding correlation of these genetic alterations with prognosis will follow in future. The minute numbers of cases involved and limited known genetic alterations used in the panel are the drawbacks of this study. As time progresses, we may find new methods of detection and more validated and clinically important genetic panels. cfTDNA is easily demonstrable and can be used as a minimally invasive diagnostic tool in brain tumors. 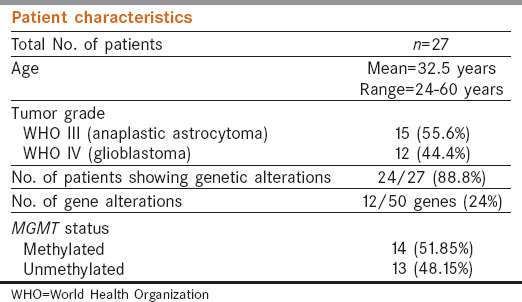 Combination of six genetic alterations, that is, EGFR, KIT, PTEN, PIK3CA, TP53, VHL, is the main alteration, and on combining these genetic alterations (Govardhan Diagnostic and Screening Genetic Module for High-Grade Glioma), at least any one variation among the combination was found in 100% of patients at any point of time. That can be a future guide toward creating a feasible, repeatable, faster, cost-effective, noninvasive, and highly predictable diagnostic tool for early diagnosis/screening. Added to this, it can also become a route for detecting early recurrence and early response assessment in HGGs. Continuation of this study on a large-scale basis with different race and ethnicity is needed to create a proper genetic module to aid as a diagnostic and prognostic marker in brain tumors as well as to guide for a genomically matched therapy. Further follow-up to correlate the genetic relationship with overall survival and disease-free survival is awaited. Patel AP, Tirosh I, Trombetta JJ, Shalek AK, Gillespie SM, Wakimoto H,et al. Single-cell RNA-seq highlights intratumoral heterogeneity in primary glioblastoma. Science 2014;344:1396-401. Hunter C, Smith R, Cahill DP, Stephens P, Stevens C, Teague J, et al. A hypermutation phenotype and somatic MSH6 mutations in recurrent human malignant gliomas after alkylator chemotherapy. Cancer Res 2006;66:3987-91. Johnson BE, Mazor T, Hong C, Barnes M, Aihara K, McLean CY,et al. Mutational analysis reveals the origin and therapy-driven evolution of recurrent glioma. Science 2014;343:189-93. Sottoriva A, Spiteri I, Piccirillo SG, Touloumis A, Collins VP, Marioni JC, et al. Intratumor heterogeneity inhuman glioblastoma reflects cancer evolutionary dynamics. ProcNatlAcadSci U S A 2013;110:4009-14. Kumar A, Boyle EA, Tokita M, Mikheev AM, Sanger MC, Girard E, et al. Deep sequencing of multiple regions of glial tumors reveals spatial heterogeneity for mutations in clinically relevant genes. Genome Biol 2014;15:530. Brandsma D, van den Bent MJ. Pseudoprogression and pseudoresponse in the treatment of gliomas. Curr Opin Neurol 2009;22:633-8. Westphal M, Lamszus K. Circulating biomarkers for gliomas. Nat Rev Neurol 2015;11:556-66. Crowley E, Di Nicolantonio F, Loupakis F, Bardelli A. Liquid biopsy: Monitoring cancer-genetics in the blood. Nat Rev Clin Onco 2013;10:472-84. Diaz LA Jr, Bardelli A. Liquid biopsies: Genotyping circulating tumor DNA. J Clin Oncol 2014;32:579-86. Wang Y, Springer S, Zhang M, McMahon KW, Kinde I, Dobbyn L, et al. Detection of tumor-derived DNA in cerebrospinal fluid of patients with primary tumors of the brain and spinal cord. PNAS 2015;112;9704-7. Moreno L, Pollack IF, Duffner PK, Geyer JR, Grill J, Massimino M,et al. Utility of cerebrospinal fluid cytology in newly diagnosed childhood ependymoma. J Pediatr Hematol Oncol 2010;32:515-8. Weston CL, Glantz MJ, Connor JR. Detection of cancer cells in the cerebrospinal fluid: Current methods and future directions. Fluids Barriers CNS 2011;8:14. Khwaja FW, Reed MS, Olson JJ, Schmotzer BJ, Gillespie GY, Guha A,et al. Proteomic identification of biomarkers in the cerebrospinal fluid (CSF) of astrocytoma patients. J Proteome Res 2007;6:559-70. Woodworth GF, Garzon-Muvdi T, Ye X, Blakeley JO, Weingart JD, Burger PC. Histopathological correlates with survival in reoperatedglioblastomas. J Neurooncol2013;113:485-93. Krueger DA, Care MM, Holland K, Agricola K, Tudor C, Mangeshkar P, et al. Everolimus for subependymal giant-cell astrocytomas in tuberous sclerosis. N Engl J Med 2010;363:1801-11. Stroun M, Lyautey J, Lederrey C, Olson-Sand A, Anker P. About the possible origin and mechanism of circulating DNA: Apoptosis and active DNA release. Clin Chim Acta 2001;313:139-42. Racila E, Euhus D, Weiss AJ, Rao C, McConnell J, Terstappen LW,et al. Detection and characterization of carcinoma cells in the blood. ProcNatlAcadSci USA 1998;95:4589-94. Dawson SJ, Tsui DW, Murtaza M, Biggs H, Rueda OM, Chin SF, et al. Analysis of circulating tumor DNA to monitor metastatic breast cancer. N Engl J Med 2013;368:1199-209. Maheswaran S, Sequist LV, Nagrath S, Ulkus L, Brannigan B, Collura CV,et al. Detection of mutations in EGFR in circulating lung-cancer cells. N Engl J Med 2008;359:366-77. Punnoose EA, Atwal S, Liu W, Raja R, Fine BM, Hughes BG,et al. Evaluation of circulating tumor cells and circulating tumor DNA in non-small cell lung cancer: Association with clinical endpoints in a phase II clinical trial of pertuzumab and erlotinib. Clin Cancer Res 2012;18:2391-401. Newman AM, Bratman SV, To J, Wynne JF, Eclov NC, Modlin LA,et al. An ultrasensitive method for quantitating circulating tumor DNA with broad patient coverage. Nat Med 2014;20:548-54. Bettegowda C, Sausen M, Leary RJ, Kinde I, Wang Y, Agrawal N, et al. Detection of circulating tumor DNA in early- and late-stagehuman malignancies. SciTransl Med 2014;6:224ra24. De Mattos-Arruda L, Mayor R, Ng CK, Weigelt B, Martínez-Ricarte F, Torrejon D, et al. Cerebrospinal fluid-derived circulating tumour DNA better represents the genomic alterations of brain tumours than plasma. Nat Commun 2015;6:8839. Lebofsky R, Decraene C, Bernard V, Kamal M, Blin A, Leroy Q,et al. Circulating tumor DNA as a non-invasive substitute to metastasis biopsy for tumor genotyping and personalized medicine in a prospective trial across all tumor types. MolOncol 2015;9:783-90. Murtaza M, Dawson SJ, Tsui DW, Gale D, Forshew T, Piskorz AM,et al. Non-invasive analysis of acquired resistance to cancer therapy by sequencing of plasmaDNA. Nature 2013;497:108-12. Leary RJ, Sausen M, Kinde I, Papadopoulos N, Carpten JD, Craig D,et al. Detection of chromosomal alterations in the circulation of cancer patients with whole-genome sequencing. SciTrans Med 2012;4:162ra154. Chan KC, Jiang P, Zheng YW, Liao GJ, Sun H, Wong J,et al. Cancer genome scanning in plasma: Detection of tumor-associated copy number aberrations, single-nucleotide variants, and tumoral heterogeneity by massively parallel sequencing. Clin Chem 2013;59:211-24. Kinde I, Wu J, Papadopoulos N, Kinzler KW, Vogelstein B. Detection and quantification of rare mutations with massively parallel sequencing. ProcNatlAcadSci U S A 2011;108:9530-5. Forshew T, Murtaza M, Parkinson C, Gale D, Tsui DW, Kaper F,et al. Non-invasive identification and monitoring of cancer mutations by targeted deep sequencing of plasma DNA. Sci Transl Med 2012,4:136-68. Rothe F, Laes JF, Lambrechts D, Smeets D, Vincent D, Maetens M,et al. Plasma circulating tumor DNA as an alternative to metastatic biopsies formutational analysis in breast cancer. Ann Oncol 2014;25:1959-65. Narayan A, Carriero NJ, Gettinger SN, Kluytenaar J, Kozak KR, Yock TI,et al. Ultrasensitive measurement of hotspot mutations in tumor DNA in blood using error-suppressed multiplexed deep sequencing. Cancer Res 2012;72:3492-8. Diehl F, Schmidt K, Choti MA, Romans K, Goodman S, Li M,et al. Circulating mutant DNA to assess tumor dynamics. Nat Med 2008;14:985-90. Diehl F, Li M, Dressman D, He Y, Shen D, Szabo S,et al. Detection and quantification of mutations in the plasma of patients with colorectal tumors. Proc Natl Acad Sci U S A 2005;102:16368-73. Shinozaki M, O'Day SJ, Kitago M, Amersi F, Kuo C, Kim J,et al. Utility of circulating B-RAF DNA mutation inserum for monitoring melanoma patients receiving biochemotherapy. Clin Cancer Res 2007;13:2068-74. Tsao SC, Weiss J, Hudson C, Christophi C, Cebon J, Behren A,et al. Monitoring response to therapy in melanoma by quantifying circulating tumour DNA with droplet digital PCR for BRAF and NRAS mutations. Sci Rep 2015;5:11198. Piccioni DE, Lanman RB, Nagy RJ, Talasaz A, Pingle SC, Kesari S. Analysis of cell-free circulating tumor DNA in patients with glioblastoma and other primary brain tumors. J Clin Oncol 2015;33(Suppl):abstract 11072. Diaz LA Jr, Williams RT, Wu J, Kinde I, Hecht JR, Berlin J, et al. The molecular evolution of acquired resistance to targeted EGFR blockade in colorectal cancers. Nature 2012;486:537-40. Misale S, Yaeger R, Hobor S, Scala E, Janakiraman M, Liska D,et al. Emergence of KRAS mutations and acquired resistance to anti-EGFRtherapy in colorectal cancer. Nature 2012;486:532-6. Majchrzak-Celinska A, Paluszczak J, Kleszcz R, Magiera M, Barciszewska AM, Nowak S,et al. Detection of MGMT, RASSF1A, p15INK4B, and p14ARF promoter methylationin circulating tumor-derived DNA of central nervous system cancerpatients. J Appl Genet 2013;54:335-44. Balana C, Ramirez JL, Taron M, Roussos Y, Ariza A, Ballester R,et al. O6-methyl-guanine-DNAmethyltransferase methylation in serum and tumor DNA predictsresponse to 1,3-bis (2-chloroethyl)-1-nitrosourea but not to temozolamide plus cisplatin in glioblastoma multiforme. Clin Cancer Res 2003;9:1461-8. Weaver KD, Grossman SA, Herman JG. Methylated tumor-specificDNA as a plasma biomarker in patients with glioma. Cancer Invest 2006;24:35-40. Wakabayashi T, Natsume A, Hatano H, Fujii M, Shimato S, Ito M, et al. p16 Promoter methylation in the serum as a basis for the molecular diagnosis of gliomas. Neurosurgery 2009;64:455-61. Lavon I, Refael M, Zelikovitch B, Shalom E, Siegal T. Serum DNA can define tumor-specific genetic and epigenetic markers in gliomasof various grades. NeuroOncol 2010;12:173-80. Govardhan HB, Khaleel IA, Shubha SA, et al. Cell-Free Circulating Tumor DNA Mutation Profiling for Cervical Carcinoma as Diagnostic Biomarker: A 50-Gene Module to Future Directive. Indian J Gynecol Oncolog 2019;17:2. DOI: https://doi.org/10.1007/s40944-018-0245-2. Boisselier B, Gallego Perez-Larraya J, Rossetto M, Labussière M, Ciccarino P, Marie Y,et al. Detection of IDH1mutation in the plasma of patients with glioma. Neurology 2012;79:1693-8.